One Paseo is a retail village and mixed-use development located in the north of San Diego County, Carmel Valley. 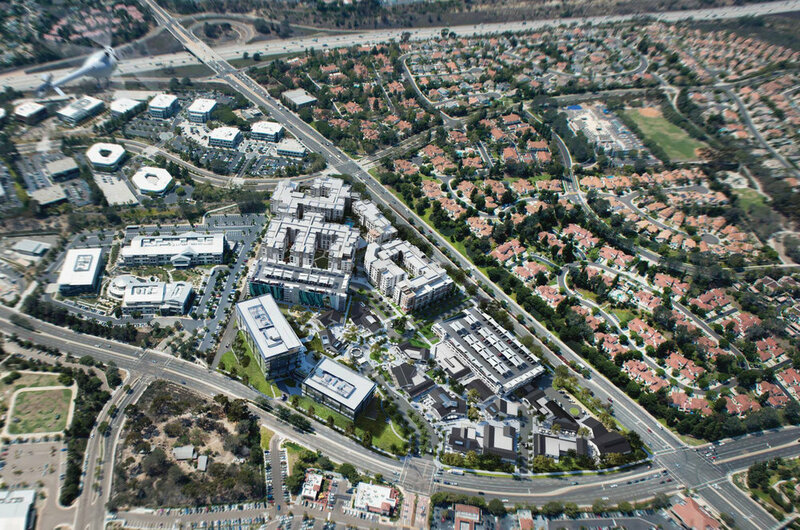 Originally master planned in the 1970s, the new design looked to fulfill Kilroy Realty’s wish to provide a center for the community that incorporates retail, office and residential buildings. The project was imagined as a new, walkable mixed-use neighborhood that would maximize California’s year-round weather. The concept was centered around the use of paseos, courtyards and plazas that would create a series of connected pedestrian experiences meandering through the project. Variously sized buildings are combined with a layered use of landscape to create a varied character. Each space feeling like an outdoor room defined by the landscape and the adjacent buildings’ uses. The heart of the project is the civic plaza a generously sized informal space of seating, relaxation and dining that can be programmed for a variety of public activities from farmers’ markets to outdoor movies.